The 2018 Ruffalo Noel Levitz National Conference will take place in Orlando July 24-26, and once again the conference will be packed with sessions on enrollment management, student success, and for the first time, higher education fundraising. We will have more than 150 breakout sessions for our 2,000 attendees. We also have four very inspiring and insightful higher education keynote speakers that we are very eager to share with all of our attendees. They include a national journalist, a college president, a best-selling higher education researcher, and a speaker who will share what we can learn from Walt Disney’s life and work—a fitting closing keynote speaker for our Orlando conference! These speakers will entertain, inform, and inspire. This is the 32nd year of the conference, and one of the great things for us to see is an audience who learns, laughs, and takes to heart what speakers like these four have to share. Byron Pitts has achieved a great deal in his life. He is a multiple Emmy-award winning journalist and the co-anchor of ABC’s Nightline. He previously was at CBS, where he was the lead correspondent at Ground Zero immediately following the September 11th attacks (for which he won an Emmy). And yet, as he will share in his opening keynote, he had the odds heavily stacked against him. Drawing on his memoir Step Out on Nothing, he will discuss how he was a “functionally illiterate” elementary school student, endured bullies and humiliation through grade school, struggled with reading, and stuttered until he was 20 years old. In his session, Dr. Howard will share his playbook for developing character-based skills that apply to anyone, in any field, at any time. These skills and attributes show leaders how to be courageous, accountable, and act with empathy, traits that will serve higher education well during a time of great tumult and transformation. This is a session that will certainly inform and inspire, providing insights that every attendee can take back to campus. What changes are in store for higher education? What will success look like for your institution in the future? These are just some of the questions Jeffrey Selingo will address in his thought-provoking presentation. He will discuss how we are in the beginning stages of far-reaching changes over the next decade, where technology is playing a larger role and students, parents, and educators alike are asking what colleges should teach and how outcomes should be measured in an era of shifting needs in the economy. Mr. Selingo will highlight how the new era of higher education will differ from the past, the new and numerous learning pathways that students might follow ten years from now, and how data and technology will play a larger role. Mr. Selingo is one of the leading experts on higher education trends. He has written about higher education for two decades, spending sixteen years as a top editor at The Chronicle of Higher Education. He is a bestselling author of There Is Life After College, College (Un)Bound: The Future of Higher Education and What It Means for Students, and MOOC U: Who Is Getting the Most Out of Online Education and Why. His writing has appeared in the Washington Post, the New York Times, the Wall Street Journal, and many others. In addition, he serves as a special advisor and professor of practice at Arizona State University and a visiting scholar at Georgia Tech’s Center for 21st Century Universities. His session will provide tremendous information and should provoke a good deal of conversation. In this keynote, Monica Jordan of Disney Institute will share how Walt Disney’s vision contributed to a culture that engaged his team in a legacy of innovation. Disney Institute will bring to life key moments from his career—from early animation to the birth of the theme park—to share business insights that we can apply to our own work. Learn about the history of Walt Disney and the best practices from Disney parks and resorts, and be inspired to embrace change, drive innovation, and lead at any level at your institution. 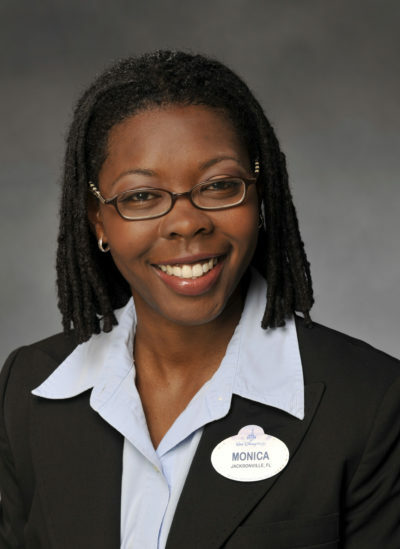 Ms. Jordan is a facilitator for Disney Institute, delivering business programs individually and through team presentations, and has managed the daily operations of attractions, stage shows, and special events while leading more than 150 hourly cast members. Her session will be a great way to close this year’s conference. 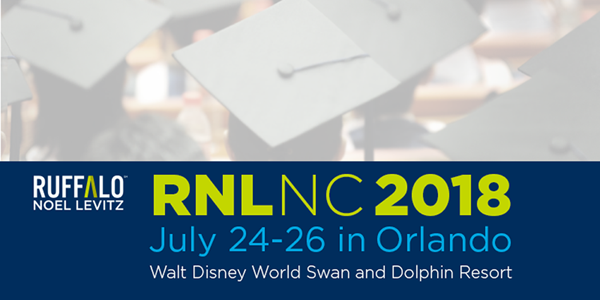 With more than 150 sessions on enrollment management, student success, and higher education fundraising, there’s something for everyone on campus at this year’s RNL National Conference. Register early and receive our special early rate, and if more than five people from your campus attend, you also receive a group discount. We hope you’ll join us and return to campus more informed, more inspired, and more prepared to help your institution thrive.